COLOR(S): Black, or salt and pepper. 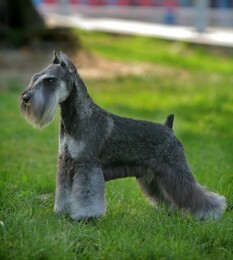 COLOR(S): Gray, steel gray, brindle, red, black, pure white, fawn or wheaten color. The massive and muscular Irish Wolfhound is one of the largest and tallest of dogs in the world. This gentle giant can reach the size of a small pony. By the age of six months they can weigh as much as ninety pounds and do not reach maturity until twenty to twenty-four months. Despite the great size, this breed is very gentle in nature. It is known as the gentle giant, they are a perfect gentleman who show no signs of aggression. These dogs are willing to please the owners and make a good family dog for those who have adequate space and a lifestyle to feed them as they are rather expensive to look after. They have a rough, shaggy coat and wiry bushy eyebrows. Colors include gray, brindle, red, black or white. Gray is the most common color. Irish Wolfhounds are sweet-tempered, patient, generous, thoughtful and very intelligent. They can be trusted with children, dignified and willing, they are unconditionally loyal to their owner and family. These dogs tend to greet everyone as a friend. They are slow to mature, it takes two whole years before they are full grown. This breed is relatively easy to train. He/she responds well to firm, but gentle training. This approach with plenty of understanding will go a long way because this dog quickly grasps what you intend. This calm dog gets along well with other dogs. This is also true with other animals if the dog has gotten to know them when it was still young. However, it might "course" a smaller dog in an open yard. Rough and harsh. The rough, medium-length coat needs regular and thorough grooming with a brush and comb. This with keep the coat in good condition. About once or twice a year pluck the coat to remove excess dead hair. This breed is an average shedder. Irish Wolfhounds require regular grooming of their hard, wiry coat or it will become matted. Comb their fur daily. Trim around the eye and ears with blunt scissors. Heart problems (heart disease), hip and elbow dysplasia, and cancers such as lymphoma. Other health concerns for the Irish Wolfhound include bone and kidney disease, eye problems, hypothyroidism, seizures, von Willebrand's disease, and bloat. Bloat is a common health issue to most dogs, being the most populous killer of dogs second to cancer. But Irish Wolfhounds are particularly susceptible to it because of their deep chests. The Irish Wolfhound does not require as much exercise as one would think for their great size, but they do need daily walks or runs or they will be inclined to be lazy. Rearing of young Irish Wolfhound puppies is critical because of their rapid growth rate. Do not take them on long walks as they can damage their joints. It is recommended that you have a large house and big, fenced backyard. Irish Wolfhounds are not good for city life, as they are very large and take up a lot of space and food. The best owner for this breed would be a family or individual living in a suburban or rural environment.